Visualize the yellow ten-petalled lotus Manipura chakra with the red Limi plasma superimposed over it at your solar plexus. 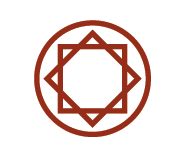 Hold this visualization and feel the two intermingle as you chant the sacred letter HRUM as long as your breath can sustain it. 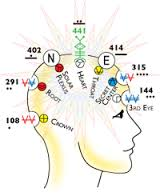 Locate Heptad Gate 402 and the Hyper neutron symbol on the 441 holomind perceiver. Its matrix location is V11:H8, eighth circuit, 9th time dimension, inner core time. Now locate it in your body at the back, top center of your skull. Visualize the Hyper neutron with the rectilinear blue Duar force field above the red Limi in your solar plexus chakra. Take the Hyper neutron into the sixth mental sphere in the sixth time dimension (blue Duar electroluminic force field H11:V15-21, left-handed time) where it activates the subliminal conscious as hyper neutronic subliminal conscious informing mental spheres three and four. 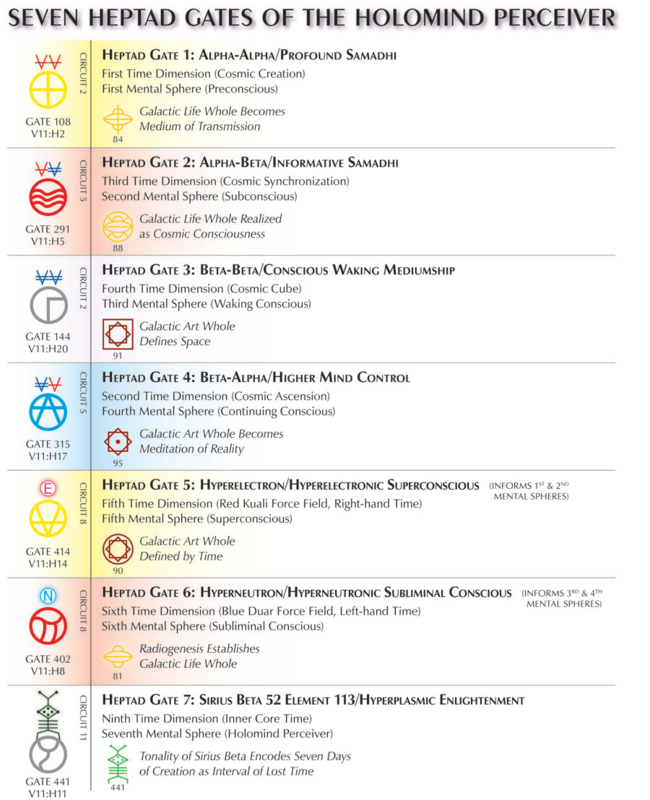 From the sixth mental sphere, mentally direct the Hyper neutron to the solar plexus chakra and impress it above the Limi seal. Hold this with four alternate nostril breaths (four times in and out through each nostril), followed by one breath through both nostrils. Ascend up the central column (spine), secreting the Hyper neutron (blue Duar force field) into all 144,000 etheric fibers of the astral body. Practice the breath of fire, rapid shallow breathing through the nose, transmuting any blockages or obscurations into streams of crystal clear hyper neutronic subliminal consciousness spreading through your entire nervous system. The black Hyper neutron with spectral, electric blue Duar force field vibrates subtle activating neutronic force into all etheric fibers. Descend back down the central channel and leave Limi at the solar plexus chakra. Return your consciousness to the sixth mental sphere, then close and seal the Heptad Gate at the back top-side of your skull. Relax and breathe slowly and deeply at least 13 times. Harmonic UR rune 81: Radio genesis Establishes Galactic Life Whole. For additional practice: Locate Heptad Gate 402 on the Hunab Ku 21. Note that it corresponds to the Yogi/Yogini, the Meditation Master, Holder of the Transcendental Wisdom; S/P Neptune, Bode Number 300.